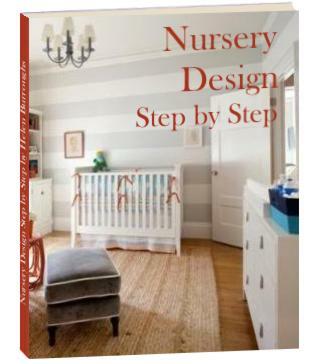 I came up with the whimsical nursery idea because I wanted to do something fun for my son's nursery. I looked online at all the bedding available and finally chose The Moby by Banana Fish. I worked from the bedding and matching accessories to complete the rest of the room. The crib and dresser are by Stanley Young American, the Built to Grow line. I had my great-aunt's old wash table which I painted white and put in the room. I also painted the flip out changing table from my other son's room. I chose a carpet that matched the blue best. 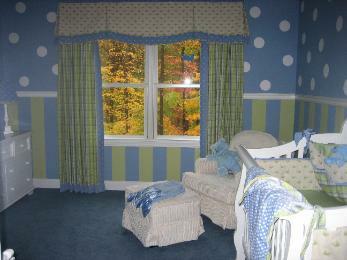 I had the window treatment custom made by Melissa Mauro of Fine Design in Frankford, NJ. Luckily the extra matching fabric was available with the bedding. I hand painted the walls myself. 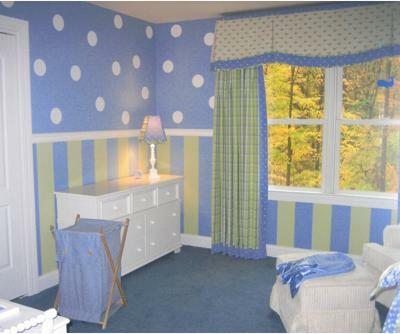 The room was a guest bedroom and the walls were already painted green (Sherwin Williams Shagreen). I used a thick quilting ruler to mark the lines with a pencil and then painted the blue stripe on the bottom. I painted the top walls blue (Ben Moore Sheer Romance). I traced a round bowl onto poster board and cut out a bunch of circles. I used double-sided sticky tape and placed the circles until I found a pattern I liked. 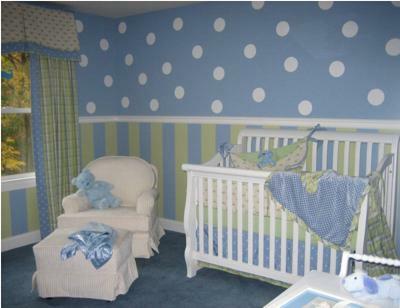 I traced the circles with a pencil and then painted the polka dots with Ben Moore Semi-Gloss white paint. It took 1-2 weeks to complete. I worked on it while my older son napped for 1-2 hrs. I found the letters at jcpenny.com and then painted them to match. 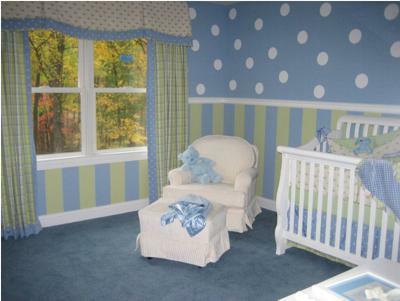 I have since found more blue and white polka dot items at our local Home Goods store. I love this room. So beautiful and the colours are so elegant. Just perfect. Well done. Very nice job. The colors are perfect. Also, love the leaves outside the window. I love the colors and the dots! The poster board circles are a great idea for getting the pattern just right! Return to Nursery Pictures Contest.